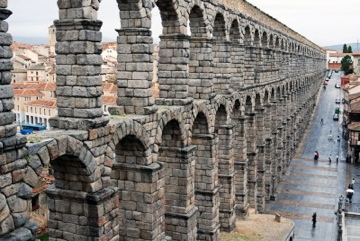 The Aqueduct of Segovia is one of the most impressive and best preserved aqueducts left in the world. Built nearly 2,000 years ago by the Romans after they conquered the city, the aqueduct was built to transport water from a river about 11 miles (17 kilometers) away through channels that led to the granite block, kilometer long aqueduct. There are 167 total arches – both single and double – with some as tall as 100 feet. This isn’t a site that takes long to see unless you want to walk the length of it but it’s hard to take your eyes off the aqueduct because there are no clamps or mortar holding it together. 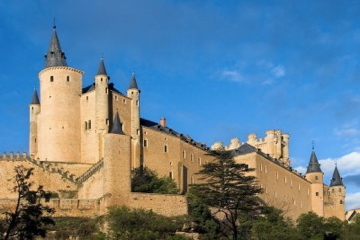 The Alcazar de Segovia is known in english as the Segovia Castle. Built nearly 1,000 years ago, the castle sits upon a rock formation and can be seen from miles away. The palace tour includes the armory, chapel, throne room, the King’s chamber, dining area, the artillery gallery, and the watchtower which provides a beautiful view of the city and countryside. Open every day from 10:00 – 7:00 (April through September) and 10:00 – 6:00 (October through March). Self guided or guided tours available. 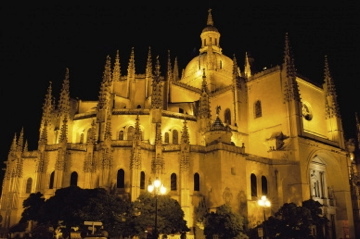 El Catedral de Segovia is known in english as the Segovia Cathedral. Built from the 16th – 18th centuries in the Gothic style, the cathedral is located in the main square of the city called Plaza Mayor. Within the cathedral walls are many chapels that are worth seeing on a self guided tour. Surrounding the old part of the city are approximately 3 kilometers (2 miles) of granite walls, 80 towers, and three main gates: San Cebrian, Santiago, and San Andres. Exploring this area is a great after lunch activity (instead of a siesta) when kids don’t want to see anymore ruins, palaces, or cathedrals. 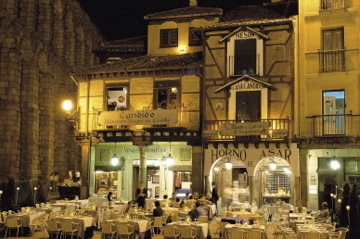 El Mason de Candido (House of Candido) is the pork “Morton’s” of Segovia with pictures all over the walls of famous patrons with the owner and maitre de of the restaurant, Senior Candido – a personable character always dressed in a suit, cufflinks, and large black rimmed glasses. El Mason de Candido has been owned and managed by the same family since 1905. El Mason de Candido is a very traditional restaurant that specializes in a dish called “cochinillo” which means “roast suckling pig” but lamb, beef, fish, soups and salads are also served. My husband and daughter enjoyed the cochinillo on several visits while I opted for salad and fish. Pork lovers adore this place but for me having lunch here was more about the experience and the atmosphere. Located right by the aqueduct in the main square, El Mason de Candido has several floors of tables that require a reservation, especially on weekends. In Spain, lunch is typically served from 2:00 – 5:00 pm but because this restaurant caters to tourists, earlier lunch reservations can be made by phone or on-line through their website (listed below). 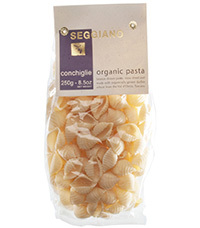 Dinner is also served and reservations are strongly recommended because this restaurant stays busy.